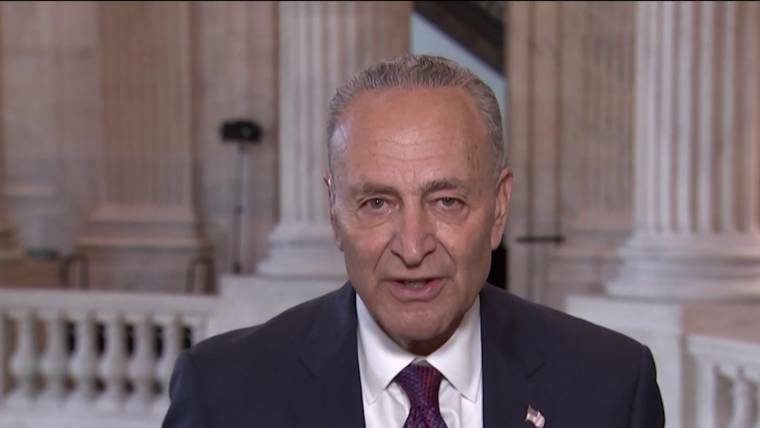 WASHINGTON — Democrats can try to derail the confirmation of Trump Supreme Court nominee Brett Kavanaugh, Senate Minority Leader Chuck Schumer said Tuesday. “The ramifications of this battle will last a generation or more. I’m going to fight this nomination with everything I’ve got,” the New York Democrat said on the steps of the Supreme Court Tuesday, flanked by the 10 Democrats who sit on the Senate Judiciary Committee. Schumer laid out the outlines of the Democratic attack: confirming Brett Kavanaugh as the next justice on the high court would reverse decades of settled law and put women’s reproductive rights at “grave, grave risk,” he said, arguing that Kavanaugh would vote to overturn the 1973 landmark Roe v. Wade ruling by the high court. And previewing another category of tough questions Kavanaugh is likely to face during confirmation hearings, Schumer pointed to the judge’s past statements suggesting that sitting presidents shouldn’t face criminal investigations, and that a president should not necessarily have to follow a law if he deems it unconstitutional. “It’s no wonder [Trump] chose Judge Kavanaugh,” added Schumer, who said that Trump knows his nominee will be a barrier for Special Counsel Robert Mueller in the investigation into Russian interference in the 2016 presidential election. White House deputy press secretary Raj Shah, asked Tuesday if Kavanaugh should recuse himself should any questions related to the Mueller probe make it to the Supreme Court, did not provide a clear answer. “Those are complex issues,” he replied. The Democratic senators said Tuesday they would demand the release of every single record that might be relevant to Kavanaugh, including emails. It’s a push that could slow the process, though to sink the nomination entirely, Schumer would need to both win over Republican votes and keep every member of his own caucus on board — including several red state Democrats up for re-election. One of those Democrats, Sen. Joe Manchin, D-W.Va., said Tuesday that he planned to do a “deep dive” on the nominee’s record. “I’ll have a look at all his findings and records and everything he has ruled on, all his writings and everything. So it’s a deep dive we have to do. I think that’s our responsibility,” he said. Schumer and Judiciary Committee Democrats spoke Tuesday as Kavanaugh arrived on Capitol Hill for his first set of meetings as Trump’s nominee, including one with Vice President Mike Pence and Senate Majority Leader Mitch McConnell, R-Ky., and one with his Hill sherpa, former Sen. Jon Kyl, R-Ariz.